Sri Mata Amritanandamayi Devi’s 30th Anniversary Tour of Europe commenced with Amma being presented two French awards for her lifetime of work as a spiritual leader and humanitarian. 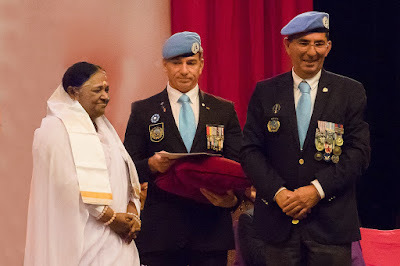 The awards, which were presented as part of a formal programme at the Zenith-Omega Arena in Toulon, France, came from the “Soldiers of Peace International Association” and from the Regional Council of the Provence-Alpes-Côtes d’Azur Region, one of the largest of France’s 13 metropolitan administrative regions. Amma’s 30th Anniversary Europe Tour will continue throughout November. Each of its stops finds Amma leading attendees in guided meditation, devotional singing and prayers for world peace. Each programme also includes a spiritual talk by Amma, wherein she offers practical solutions for personal fulfilment, as well as guidance on how society can face the most pressing challenges of our time. Programme attendees also get the opportunity to receive Amma’s darshan—a spiritual blessing in the form of a motherly embrace. The Europe Tour includes stops in Frankfurt, Germany; Toulon, France; Winterthur, Switzerland; Milan, Italy; London, United Kingdom; Munich, Germany; Châlons-en-Champagne, France; Houten, Netherlands; and Helsinki, Finland, and concludes on December 6th in Valencia, Spain. All programmes are free and open to the public.